Compost Toilets & Minimal-Water-Usage Sinks — Kate Friedman Consulting, Inc. So for me, this is one of the most fascinating parts of Sadhana Forest. To begin, the toilets are amazing. There are indoor and outdoor ones. They are the same except for access to light, and that the indoor ones feel a bit more like traditional toilets because of a roof on top. Inside the toilets there are: a pee hole, a poo hole, sawdust for covering your poop (which turns it into compost), and my favorite, the pee pan, for those of us who poo and pee at the same time. The last, but most important thing, is the bucket of water, and a cup for scooping. The water bucket has a lid to keep the flies away. So when you poo, you use your right hand to take a cupful of water and then you clean your bum with your left hand. Then you use your right hand for everything else. The sinks, if you will, are cups with a tiny hole at the bottom, attached to a tree, along with a bottle of lemon juice soap. Again, with your right hand, you uncover the lid of a water bucket and scoop out some water to fill the “sink”. Then you wash. It is amazing that you use less than a cup of water to clean your hands. It’s actually mind-blowing to think of how much water we actually waste. It makes me very sad. I’ve been talking with Nikki, one of the long-term volunteers about outfitting an apartment like mine, in a major city, NYC, with a composting bathroom. Can you imagine? 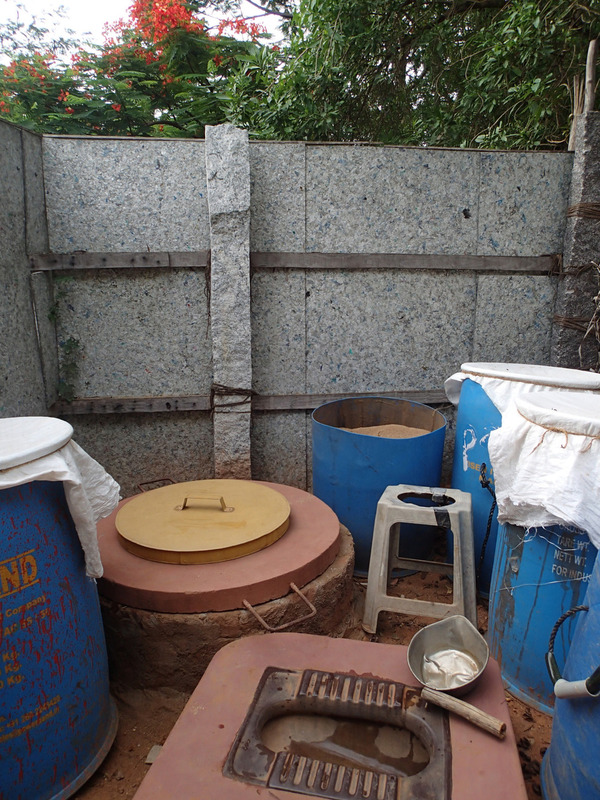 So, the composting at Sadhana takes about 6-8 months and then can be used in the forest. This purposeful use of waste is genius. It’s one of the most revolutionary, brilliant ideas I’ve ever come across. Nothing smells bad; there are no flies in the bathrooms. This is a perfected system. (And because urine is good for the forest you can also pee anywhere). I’ve never talked about or heard as much about poo in my life as I have since moving to Sadhana. Because of the compost toilets and having to teach new people about them daily and answer questions, poo is a main topic of conversation. It’s also a way to know how healthy you are by comparing poo with your friends. As a kindergarten teacher I’m fairly desensitized to poo talk but this may be overkill even for me. Older PostVegan sushi, and more!